This sort of has something to do with music, or at least the bastardization of it, thus I am posting my rant into the universe here on Melismatic. Words cannot even begin to express my utter disdain for the "couple" that is Heidi Montag and Spencer Pratt. If you are unfamiliar -- and believe me, if you aren't you should be thankful of this -- these two wannabes gained "fame" thanks to a "reality" show called "The Hills", featured on MTV, a spinoff show of "Laguna Beach" centered around Lauren Conrad (who recently exited the show after disagreements with the producers), an aspiring fashion designer fresh from college. Heidi was her best friend in the earlier seasons, until the two had an "epic" falling out due to Lauren's distaste for Heidi's boyfriend, Spencer. I'll spare you the rest, because it is pretty irrelevant. I'll admit to occasionally watching "The Hills" back when it first started, because a good friend of mine is an aspiring fashion designer, and I obviously would like to break in to the music business (not unlike Lauren's other friend on the show, Audrina Patridge, who "works" at Epic Records). However, the show has become a staple for teenage viewers everywhere for it's "drama", leading it to be parodied and lampooned from every edge of the celeb-universe. Heidi and Spencer are often noted for their eagerness to, if you don't mind the term, "sell themselves out" (and I'm putting that mildly) to the press, the paparazzi and to anyone willing to pay them. First, it was their omnipresence of gossip blogs and tabloids, then it was Heidi's fledgling pop music career. Apparently, she wants to record now under the moniker "H", which takes me back to the late 90's with that Euro-poptastic awesomely bad group, Steps ("Oneeeee for sorrow...ain't it too too bad...."). I'm not afraid to say that some of Heidi's leaked material was listenable (some). In fact, I've always kind of felt like Heidi reminded me of a friend I had in college. It's Spencer, the soul-sucking boyfriend turned husband of hers, who is kind of like a scar you can never get rid of no matter how much Neosporin you put on it, that really grinds my nerves to dust. These two are hardly celebrities, because they have nothing to be famous for. They are like Paris Hilton but worse -- at least Paris has used her spotlight to create products and films that have been embraced by some faction of the public. Heidi and Spencer remain in this kind of famous-for-no-reason limbo that makes them insufferable and infuriating. 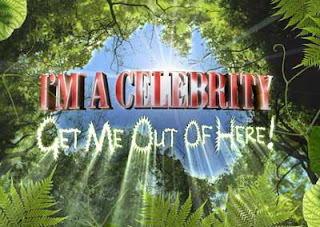 Thus the reason for this post: the two's most recent attempt to solidify their "celebrity" status with yet another photo-op was to appear on the rehashing of the new NBC show I'm A Celebrity...Get Me Out of Here!, which sends D-list celebrities to a jungle setting, and tapes them. It originally began in the UK, before coming here in 2003 (featuring Tyson Beckford, pre-Keeping Up with the Kardasians Bruce Jenner, Jennifer Lopez's ex-husband Cris Judd). The series began yesterday, and of all of the "celebrities" featured in the series, Heidi and Spencer where the most widely touted. Others included Sanjaya Malakar (American Idol), Janice Dickinson (former model/current pill popper), and Patti Blagoveich (the wife of fallen Illinois governor, Rod Blagoviech). So much so that Spencer debuted his first rap single (and that is not a joke) via iTunes, originally titled "I'm a Celebrity (Get Me Out of Here)". Well, at least he got one part right: he does need to get out of here, but he is certainly no celebrity. In the low-budg clip, Spencer spouts off about his "swagger", his Twitter account and how much money he has. I highly suggest you don't click the above link unless you want your ears to bleed. Trust me on this. However, in a semi-believable turn of events, it was announced today that the pair have already quit the show, lasting a total of three days in the jungles of Costa Rica. So much for charity. I found their exit to be quite hilarious, until I read a recent article on Billboard that stated Spencer wanted to continue with his music career, hoping to go in a "catchy ringtone stuff" kind of direction. To make matters worse? He's already hard at work with Steve Morales, which just killed me. For those of you who don't know, Morales has built up his street credit, as he is an oft-collaborator with Kara DioGuardi, and has written and produced staple songs for Enrique Iglesias ("Don't Turn off the Lights", "Escape"), Jessica Simpson ("A Little Bit"), Christina Aguilera ("Get Mine, Get Yours"), and most importantly, my beloved Soluna ("Bring It To Me"). So, Steve -- I beg you. Get back to your roots making quality pop with quality people. As the music video for "Bring It To Me" is a little hard to find these days (sob! ), check out this early performance of the girls performing it live at the Yahoo! studios back when this was their first single (over the eventual first single, ballad "For All Time"). I knew about Heidi and Spencer and about how they're famous for nothing and I tried my best to actually listen to one of Heidi's songs in full(I failed.) but what in heaven's name was Spencer doing rapping with a snake around his neck? I don't even want to talk about how bad the rapping itself was.